This study explored how mothers of adolescents with disabilities and mothers of adolescents with typical development perceive the amount of childcare they perform compared with the amount provided by fathers and other caregivers. The study included 40 mothers of adolescents (20 with disabilities, 20 with typical development). For 7 consecutive days, the mothers completed 24-hour time diaries indicating who provided care for the adolescent. The mothers also estimated the percentage of child supervision that they performed and the percentage that other caregivers performed and noted how satisfied they were with the division of adolescent supervision. On average, mothers in both the disability group and the typical development group estimated that they performed the majority of adolescent supervision, but they were satisfied with the division of adolescent supervision. Mothers of adolescents with disabilities spent significantly more time supervising their children than mothers of adolescents with typical development. No significant differences were found between groups in the perceived amount of time that adolescents were supervised by fathers, grandparents, or siblings. Factors that affect childcare activities include the children's ages, parental preferences for childcare arrangements, parental work status, and the availability of non-parental childcare (Laughlin, 2013). However, there is limited research on the effects of these factors on parents of adolescents with disabilities and whether their childcare dynamics differ from those of families with typically developing adolescents. This information is essential for creating approaches to assessment and intervention that address the needs of all family members, including mothers and adolescents with disabilities. Despite changes over time in the work status of mothers, in the general population, most childcare responsibility continues to be assumed by mothers. Bianchi (2011) studied patterns of parental time use (between 1965 and 2009) by analyzing data from time use diaries of families with typically developing children younger than 18 years. This study found that although mothers' hours of paid work increased during this period, mothers continued to spend more time than fathers on household tasks, including childcare. In 1965, mothers spent an average of 8.4 hours per week on paid work and 10.2 hours per week on childcare. In 2008, mothers' average time spent on paid work increased to 22.6 hours per week and average time spent on childcare increased to 13.9 hours per week. Married fathers' time spent performing childcare also increased after the 1960s, although their time spent on paid work remained relatively stable. Bianchi suggested that the dual increase in parental childcare activities is evidence of a more intensive form of child-rearing. Musick, Meier, and Flood (2016) found that mothers reported less happiness, more stress, and greater fatigue in time spent with children compared with fathers as a result of this shift to more time-intensive and child-centered parenting. Raising children affects parents' work participation, although mothers and fathers experience these effects somewhat differently. Parenting may affect women's work participation during their 20s and 30s, but this effect decreases during their 40s and 50s, when their children achieve more independence (Apps & Rees, 2005; Kahn, García-Manglano, & Bianchi, 2014). Although men's time spent working appears somewhat consistent during the years when their children live at home, women's work participation is dependent on the ages of the children. In many Western countries, women's participation in paid work decreases early in the life of a child and then increases as the child gets older (Anxo et al., 2011; Apps & Rees, 2005; Krantz-Kent, 2005; Pailhé & Solaz, 2006). One reason for women's increased participation in the workforce as their children get older is a decreased need for supervision (Craig & Sawrikar, 2008). Adolescents in the general population spend more time unsupervised than younger children (Afterschool Alliance, 2003; Laughlin, 2013). Mothers' work status is a major factor that governs parental supervision of preadolescents and adolescents. Unemployed mothers provide more supervision to their preadolescent and adolescent children than mothers with full-time employment (Craig & Sawrikar, 2008; Laughlin, 2013; Wight, Price, Bianchi, & Hunt, 2009). Parents report less difficulty making childcare arrangements for older children than for younger children (Craig & Sawrikar, 2008). If no supervision can be supplied, many parents allow preadolescents and adolescents to look after themselves because the parents believe that their children have many of the basic skills needed to care for themselves safely (Laughlin, 2013; Mahoney & Parente, 2009). However, this is less likely to be true for adolescents with disabilities (McCann, Bull, & Winzenberg, 2012). A systematic review of 32 studies in Australia, Canada, Europe, Israel, and the United States explored the time use of parents of children with disabilities or chronic illnesses. Several themes were developed: a significant caregiving burden that does not decrease as the child gets older, the time needed to provide supervision to children, and the addition of tasks (e.g., medical appointments and therapy, medication administration, and health care management) beyond those of a typical parenting role (McCann et al., 2012). The authors pointed out that a child's disability or chronic illness may increase “unpredictability” for parents when carrying out standard caregiving tasks. Additionally, parents of children with disabilities and chronic illnesses may perform these caregiving tasks throughout their children's lives, whereas parents of typically developing children usually spend less time performing caregiving tasks as their children grow older. Tadema and Vlaskamp (2010) found no significant decrease in the perceived caregiving burden when comparing parents of children with disabilities who were 9 to 18 years with parents of children with disabilities who were 1 to 8 years. McCann et al. (2012) highlighted that many children with chronic illnesses or disabilities require increased supervision because of behavioral and/or safety issues. They found that parents of children with complex needs have increased caregiving requirements that often do not decrease with the child's age. They argued that child supervision occurs in conjunction with other daily tasks, such as homemaking occupations. In addition, parents of children with disabilities or chronic illnesses perform tasks beyond the typical parental role, such as managing complex medical care and providing therapeutic activities. Health care professionals may increase parents' childcare responsibilities by assigning additional tasks to parents, such as implementing a behavior modification program, adding enrichment activities, and carrying out home programs (McCann et al., 2012). Special caregiving tasks can add to the childcare responsibilities of parents (usually mothers), and parents may be overwhelmed by extraparental roles. Fathers' involvement with their children with disabilities has been studied and compared with that of both mothers of children with disabilities and fathers of children without disabilities. However, few studies have addressed the time use of fathers of adolescents with disabilities. In studies of both parents of children with disabilities and parents of adult children with disabilities, mothers reported more time spent on daily caregiving tasks than fathers (Crowe, Van-Leit, & Berghmans, 2000; Hartley, Mihaila, Otalora-Fadner, & Bussanich, 2014; Rowbotham, Carroll, & Cuskelly, 2011). Fathers of children 6 months through 5 years with disabilities spent similar amounts of time during weekdays on child-care tasks compared with fathers of children with typical development (Crowe et al., 2000). In a sample of fathers of children 3 to 14 years, Sanders, Crowe, VanLeit, and Hinson (n.d.) showed that fathers of children with disabilities spent more time with their children on the weekends than fathers of children without disabilities. Research on mothers of adolescents with disabilities or chronic conditions showed that their lives are affected significantly by their children's needs. During midlife, many mothers of children with disabilities continue to provide care for their adolescent or young adult children at levels similar to the care that they provided when their children were young (Christin, Akre, Berchtold, & Suris, 2016; Schneider, Wedgewood, Llewellyn, & McConnell, 2006; Todd & Jones, 2005). In addition, adolescents with developmental disabilities spent significantly less time participating in household tasks than their typically developing peers (Amaral, Franca Drummond, Coster, & Cotta Mancini, 2014). According to Smith et al. (2010), mothers of adults and adolescents with autism spectrum disorder spent significantly more time on childcare and housework than the comparison group. This finding indicates that adolescents with typical development may help to relieve a portion of parents' caretaking burden by participating in household management, whereas some adolescents with disabilities are unable to help in this way. Additionally, mothers of adolescents with disabilities often lose the support of their typically developing children as the older children leave home; further, over time, grandparents become less physically able to help the parents to provide care (Schneider et al., 2006; Todd & Jones, 2005). Formal supports, such as special education and pediatric health care, disappear as children with disabilities enter adolescence, increasing the burden on mothers at this time (Davies, Rennick, & Majnemer, 2011; Foley, Dyke, Girdler, Bourke, & Leonard, 2012; Schneider et al., 2006). The marked difference in the duration and intensity of the caregiving role for parents of children with disabilities may increase the caregiver's own aging-related challenges (Yamaguchi, Sonoda, & Suzuki, 2017). Although childcare responsibilities may be increased for mothers of children, adolescents, and adults with disabilities, their satisfaction with their parental responsibilities is not necessarily decreased. Studies have shown that a child's disability has little negative effect on parental satisfaction with childcare arrangements and the division of labor (Barnard-Brak, Nuner, Sulak, & Davis, 2014; Crowe et al., 2000; Hartley et al., 2014; Simmerman, Blacher, & Baker, 2001). Rowbotham et al. (2011) found that most parents of adults with intellectual disabilities reported satisfaction with their division of caregiving responsibilities. This study also found that mothers of adults with intellectual disabilities reported higher satisfaction with caregiving tasks than fathers of adults with intellectual disabilities. Mothers' satisfaction with caregiving tasks was positively correlated to the number of hours spent on these tasks, whereas fathers' satisfaction was unrelated to the number of hours spent on caregiving tasks. The Dynamic Occupation in Time model theoretically guided this study (Larson, 2004). The complex time demands on mothers, especially mothers of children with disabilities, is relevant to the Dynamic Occupation in Time model, including occupational engagement and context, perceived complexity and novelty of activities and routines, and reflective occupational modes. For mothers, childcare responsibilities affect other occupations, habits, and required and selected time use. Further, often the unpredictable medical conditions of children with disabilities can deconstruct mothers' daily lives and create overwhelming occupational complexity. Assistance with childcare responsibilities can facilitate changes in mothers' time use and occupational choices. What is the difference between mothers and fathers of adolescents with disabilities and mothers and fathers of adolescents with typical development in time spent providing child supervision? How much time do adolescents with disabilities and adolescents with typical development spend in the care of someone other than their parents, independently, or at school? How do the child supervision responsibilities of mothers of children with disabilities and mothers of children with typical development change over time? What percentage of child supervision do mothers of adolescents with disabilities and mothers of adolescents with typical development estimate that they perform? How satisfied with the division of child supervision are mothers of adolescents with disabilities and mothers of adolescents with typical development? This study compared two groups of U.S. mothers: 20 mothers of adolescents with disabilities (disability group) and 20 mothers of adolescents with typical development (typical development group). Those included in the disability group reported having an adolescent son or daughter with a disability. Disability was considered present if the parents reported that the adolescent required significant assistance in at least three of the following areas: mobility, eating, toileting, communication, leisure activities, supervision while spending time alone, and money management. For those included in the typical development group, the parents reported that the target adolescent had no history of health or developmental concerns. In addition, the target adolescent was not receiving special services, and the family had no other children with disabilities. Mothers in the typical development group were matched by the first author to mothers in the disability group by age of the target adolescent (within 1 year), number and ages of other children (within 1 year), and hours of paid work. Work hours were classified as none (0–5 hours per week), part time (6–34 hours per week), and full time (35–50 or more hours per week). All parents in both groups were married, heterosexual couples. However, some parents in the study were not the biological parents of the target adolescents. Characteristics of the adolescents and the families are shown in Table 1. No significant differences were noted between the groups in fathers' and mothers' ages or education levels. Families in the disability group reported significantly less income than those in the typical development group. Of the adolescents in the disability group, 17 had siblings living at home, with an age range of 5 to 20 years (average age, 12.3 years). In the typical development group, 15 adolescents had siblings living at home, with an age range of 4 to 20 years (average age, 11.8 years). No significant difference was found between the groups in age or number of siblings living at home. The target adolescents in the study ranged in age from 13 to 19 years. The average age of adolescents in the disability group was 14.9 years, with standard deviation of 1.7 years. Diagnoses included Prader-Willi syndrome, cerebral palsy, Down syndrome, autism spectrum disorder, and multiple disabilities. The disability group included 9 girls and 11 boys, and the typical development group included 12 girls and 8 boys. The average age of adolescents in the typical development group was 15.3 years, with standard deviation of 1.7 years. No statistically significant difference was found in adolescent age in the two groups. Adolescent and family demographics and mothers' satisfaction with the division of childcare activities. To obtain demographic information about the participants, the researchers used the Demographic Background Questionnaire, an instrument created by the first author specifically for this study. The Demographic Background Questionnaire included questions about characteristics of the mothers, the target adolescents, and their families, in addition to questions about mothers' perceptions of and satisfaction with the distribution of housework and childcare in the household. Amount of time spent with the adolescent by caregivers. The Caregiver's Activity and Recording of Events (CARE) inventory, which was created by the first author, is a 7-day time diary of mothers' activities (Crowe, 2001). The CARE inventory has three parts: (a) recording the mother's activities in 30-minute increments over seven 24-hour days; (b) rating the quality of the day on a 5-point Likert-type scale (ranging from 1, indicating poor, to 5, indicating wonderful) and noting whether the day was typical (yes or no); and (c) recording who was responsible for the adolescent at that time. This study focused on the third part of the CARE inventory. For each half-hour increment, the mother indicated whether she or another caregiver was with the adolescent of focus, if the adolescent was responsible for heror himself, or if the adolescent was sleeping. If someone other than the mother cared for the adolescent during that interval, the mother noted who was providing care (father, grandparent, paid caregiver/nurse, sibling, other caregiver, school or other program) or indicated that the adolescent was independent at that time. The study was approved by the University of New Mexico Human Research Protection Office. All participants were given time to ask questions before they signed a consent form that carefully described the study. The first author and nine graduate students collected data for the study. Before data were collected, the first author established procedural agreement with each of the student data collectors using a procedural checklist. The first author conducted two procedural checks with each data collector using two pilot participants before data were collected. The first author then performed procedural checks on the first and fifth home visits of each data collector. Overall, the average procedural agreement during these checks was 96%. Participants were screened for eligibility based on family and adolescent characteristics. Once the eligibility and matching criteria were met, a home visit was scheduled. During the home visit, participants completed the Demographic Background Questionnaire. Participants were then taught how to complete the CARE inventory using hypothetical scenarios. Once participants showed competence and understanding (fewer than two errors on the hypothetical scenario), they were given a CARE inventory to complete for 1 week. Participants were asked to begin filling out the CARE inventory the next day or on the first day of the next typical week (during the school year, but not during the summer, vacations, or holidays). Data collectors contacted the participants during the middle of the recording week to monitor their progress, answer questions, and set up a time to retrieve the completed CARE inventory. On retrieval, each participant was compensated with a gift card for her time. Descriptive statistics were calculated for demographic data on the families and target adolescents. Student's t tests were used to compare parental age and education level, adolescent age and gender, and the number and ages of siblings living at home between the disability and typical development groups. Descriptive statistics were calculated for the time that the mothers perceived that the target adolescents spent with their mother, father, grandparent, paid caregiver/nurse, sibling, or other caregiver; in school or another program; and in independent activity. The two groups were compared with a Wilcoxon test that accounted for the high variability among participants. Means were calculated for mothers' estimated percentage of adolescent supervision between themselves and the fathers and for their satisfaction with the division of adolescent supervision. Student's t tests were used to compare the means for the two groups. 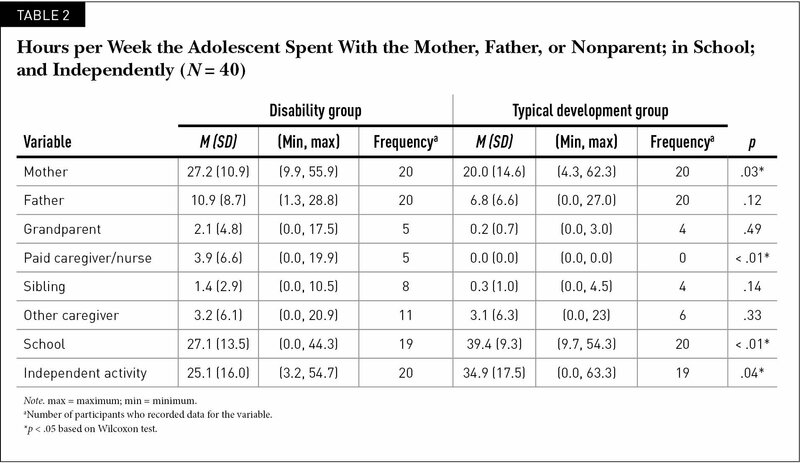 Table 2 shows the mean, standard deviation, minimum, maximum, and level of significance between the two groups in the time that the mothers reported that adolescents were supervised by caregivers, were in school, or were independent. All of the mothers reported that they spent some time supervising the target adolescent. Those in the disability group reported spending significantly more time supervising the adolescent than those in the typical development group. Mothers' perceptions showed no significant difference between the amount of time that the fathers of adolescents in the disability group and the fathers of adolescents in the typical development group spent supervising the target adolescent. However, wide variance was seen for the time that fathers of adolescents in both groups spent providing supervision. In the disability group, mothers reported that fathers spent as few as 1.3 hours per week and as many as 28.8 hours per week providing supervision to the target adolescent. Similarly, in the typical development group, fathers' supervision time ranged from 0 to 27 hours per week. No significant differences were seen between the disability group and the typical development group for the time that grandparents, siblings, and other caregivers spent providing supervision to the target adolescents. In the disability group, 5 adolescents were supervised by grandparents, 8 by siblings, and 11 by other caregivers. In the typical development group, 4 adolescents were supervised by grandparents, 4 by siblings, and 6 by other caregivers. Five adolescents in the disability group were supervised by a paid caregiver or nurse compared with zero in the typical development group. Both groups showed a large difference between the mean number of hours that mothers and fathers spent supervising the target adolescent. In the disability group, mothers spent a mean of 16.3 more hours per week on adolescent supervision compared with fathers. In the typical development group, mothers spent a mean of 13.2 more hours per week on adolescent supervision compared with fathers. In both groups, the difference between mothers' and fathers' supervision time was significant (p < .01). Before completing the CARE inventory, mothers in both groups were asked to estimate the percentage of supervision that they provided and the percentage that the fathers performed. On average, mothers in the disability group estimated that they performed 74% of child supervision in their home, and mothers in the typical development group estimated that they performed 66%. Most mothers were satisfied with the division of responsibility for child supervision in their home (disability group, 75%; typical development group, 95%). No significant differences were found between the two groups in either the estimated percentage of supervision performed or satisfaction with the division of caregiving responsibility. The study findings highlight the effect of children's disabilities on caregivers. As in previous studies, this study showed that mothers perform the majority of caregiving tasks (Bianchi, 2011; Crowe et al., 2000; Hartley et al., 2014; Luijkx, van der Putten, & Vlaskamp, 2017; McCann et al., 2012; Rowbotham et al., 2011). When viewed in context with similar studies conducted by the first author (Crowe & Florez, 2006; Crowe et al., 2000; Sanders et al., n.d.), it appears that mothers of children with disabilities and mothers of children with typical development spend less time performing childcare as their children get older. However, mothers of children with disabilities consistently provide more child supervision than mothers of children with typical development, and the gap in supervision time between the two groups widens as children reach adolescence. This increasing gap was not found with fathers. A study of children who were 3 to 14 years (Sanders et al., n.d.), using the same methods, found that mothers in the disability group spent a mean of 1.4 hours more per week on child supervision than mothers in the typical development group. Fathers in the disability group spent a mean of 5.4 more hours per week on child supervision than fathers in the typical development group. The current study found differences between groups of 7.2 hours per week for mothers and 4.1 hours per week for fathers. A significant difference was found between the groups for the time that mothers spent supervising adolescents, but not for the time that fathers spent providing supervision. These results are consistent with research that indicates that mothers of children with disabilities continue to provide a high level of supervision as their children get older, although fathers' involvement does not necessarily increase (Rowbotham et al., 2011; Todd & Jones, 2005). Home (2002) hypothesized that the unequal division of labor among parents of individuals with disabilities is a symptom of societal gender inequality and suggested that societal norms assume that mothers will perform the majority of child caregiving, particularly when responsibilities are increased by a disability. The current study did not explore the complexities of mothers' personal feelings about caregiving for their adolescents. However, despite the perception that they provided the majority of caregiving, most mothers expressed satisfaction with how much supervision they and their partners performed. This result was consistent with other studies of mothers' satisfaction with the division of caregiving within the family (Barnard-Brak et al., 2014; Crowe et al., 2000; Hartley et al., 2014; Simmerman et al., 2001). Home (2002) suggested that raising a child with a disability offers many mothers deep personal rewards, but that it also requires great sacrifices, including decreased workforce and leisure participation, increased stress, and social isolation. As would be expected, although 25% of adolescents in the disability group spent time in the care of a paid caregiver and/or nurse, no adolescents in the typical development group did. This finding may indicate that there is an added financial burden associated with raising an adolescent with a disability. Families of children with disabilities often experience a higher financial burden than families of children with typical development (Anderson, Dumont, Jacobs, & Azzaria, 2007; Barnard-Brak et al., 2014; Stabile & Allin, 2012). The financial burden of families of children with disabilities may be in part the result of reduced parental work hours, the high cost of appropriate childcare, and increased health care expenses (Parish & Cloud, 2006). The literature indicates that low economic status may compound the challenges of children with disabilities and their families through decreased health, development, and emotional well-being (Park, Turnbull, & Turnbull, 2002). The current study suggests that adolescents with disabilities do not spend as much time independently as adolescents without disabilities. On average, adolescents in the typical development group spent nearly 10 more hours per week in independent activity than adolescents in the disability group. Most adolescents begin to spend more time independently, in part because of parents' expectations of increasing self-sufficiency as the children grow older (Laughlin, 2013; Mahoney & Parente, 2009). For many parents, encouraging independence in adolescents paves the way for future independent living. Independent living is also often a goal for many adolescents with disabilities and their families (Rehm, Fuentes-Afflick, Fisher, & Chesla, 2012). However, young adults with disabilities have reduced participation in many areas, including employment, education, independent living, marrying, and having children (Blomquist, 2007). Mothers in this study reported that adolescents with disabilities spent significantly fewer hours in school than adolescents with typical development. National data from the United States showed that students with disabilities are more likely to miss school than those with typical development (Child Trends Data Bank, 2014; Redmond & Hosp, 2008; Reuben & Pastor, 2013). Additionally, those with disabilities are approximately twice as likely to drop out of high school as their typically developing peers (Blomquist, 2007). Decreased participation in meaningful activities and lower levels of education among individuals with disabilities may increase their reliance on their families for social and financial support. Occupational therapists and other professionals can better serve families by inquiring about family culture, including the division of caregiving. One way to obtain this information is to include questions about caregiver time use and roles on intake forms and evaluations. This approach would help professionals to understand the demands on caregivers and to work within these parameters to create family-centered interventions. Peer support may be helpful to caregivers of children with disabilities. One study showed that mothers of children with disabilities who had more informal supports had reduced stress levels and an increased sense of well-being (Jung et al., 2010). Some mothers reported that their informal supports were as important for healthy coping as formal services. When providing family-centered care, professionals should consider including referrals to local caregiver support groups. Wong and Shobo (2017) suggested the potential benefit of services and programs to reduce daily caregiving demands for middle-aged and older caregivers. It may be helpful to suggest that families consider recruiting other caregivers and discuss alternative ways to divide caregiving responsibilities among family members, especially as the child with disabilities grows older. It is also important for professionals to listen to the expressed needs of mothers of adolescents with disabilities and to use this knowledge to guide interventions. VanLeit and Crowe (2002) found that mothers of children with disabilities reported benefit from an evaluation process that included questions about their perceptions of time use and satisfaction with their daily tasks. Further, in this study, mothers reported significantly increased satisfaction with task performance after participating in individual and group interventions that addressed their self-identified issues in this area. As the authors noted, many mothers believed that their own needs have not been considered in the big picture of their children's care. Family-centered care includes addressing the needs of caregivers, including their perceived challenges in providing care for their children. This study included only families headed by married, heterosexual couples, which could have influenced factors in time use. An increasing number of households have a nontraditional family structure, and caregiving patterns may differ accordingly. This study focused solely on the perspective of mothers, who recorded all data on the supervision performed by themselves, their partners, and other caregivers. Fathers and adolescents may have perceived the allocation of supervision differently than the mothers who reported time use. Research on the time use of mothers of adults with disabilities would help to complete the picture of the effect of a child's disability on a mother's time use. In addition, it would be beneficial to explore differences in the childcare responsibilities of families from different cultural groups. Future research is also necessary to investigate time use and caregiving patterns of nontraditional families of children with disabilities. Because all families are different, studying the experiences of all types of families is important when exploring the implications of caring for a child with a disability. Finally, studying the time use of fathers of children with disabilities would provide a more complete understanding of the demands of parenting children with disabilities. Crowe, T. K. (2001). Caregiver's Activity and Recording of Events Inventory (CARE). Unpublished assessment, University of New Mexico, Albuquerque, New Mexico. Davies, H., Rennick, J. & Majnemer, A. (2011). Transition from pediatric to adult health care for young adults with neurological disorders: Parental perspectives. Canadian Journal of Neuroscience Nursing, 33(2), 32–39. Home, A. (2002). Challenging hidden oppression: Mothers caring for children with disabilities. Critical Social Work, 3(1), 88–103. Krantz-Kent, R. (2005). Variations in time use at stages of the life cycle. Monthly Labor Review, 128, 38–45. Sanders, H., Crowe, T. K., VanLeit, B. & Hinson, K. L. (n.d.). Mothers' perceptions of childcare responsibility: The impact of a child's disability. Unpublished manuscript, University of New Mexico, Albuquerque, New Mexico. Dr. Crowe is Professor Emeritus, University of New Mexico, Albuquerque, New Mexico. Ms. Carvlin-Miller is Occupational Therapist, Rio Las Estancias, Albuquerque, New Mexico. Ms. Concotelli-Fisk is Senior Social Worker, University of New Mexico Health Sciences Center, Albuquerque, New Mexico. The authors thank the women who participated in this study and thereby enriched the body of knowledge of mothers' experiences; Cynthia Applegate, MOT, OTR/L, Glennita Haskey, MOT, Gina Hughes, MOT, OTR/L, Sue Illif, MS, OTR/L, Sarah Mugavero, MOT, OTR/L, Kristina Perea, MSW, and Neha Zalavadia, MOT, OTR/L, for collecting, coding, and entering data; and Brian Fisk, MS, Margaret L. Sanders, PhD, and Betty Skipper, PhD, for statistical support. Address correspondence to Terry K. Crowe, PhD, OTR/L, FAOTA, University of New Mexico, MSC09 5240, Albuquerque, NM 87131-0001; e-mail: tcrowe@salud.unm.edu.